Why Choose Our Laptop Stand? Efanr aluminum laptop stand is ergonomically designed to relieve strain on wrists, shoulders and neck in a comfortable typing angle. Hollow design can help to keep the laptop from overheating; Silicone pads to keep it in place and prevent it from sliding down as well as scratches. Aluminum material, beautiful & durable. Folding storage, easy to carry with you. Multi function design provides different support States for notebooks. A hollow design increases airflow around the laptop and keeps the laptop from overheating. The corners of the arc protect your computer from being scratched while protecting your computer. The 18 degree tilt angle is ergonomically designed to protect the visual and human shoulders and neck. Unique cable hole design, convenient for cable management and keeps connections handy and accessible during using. 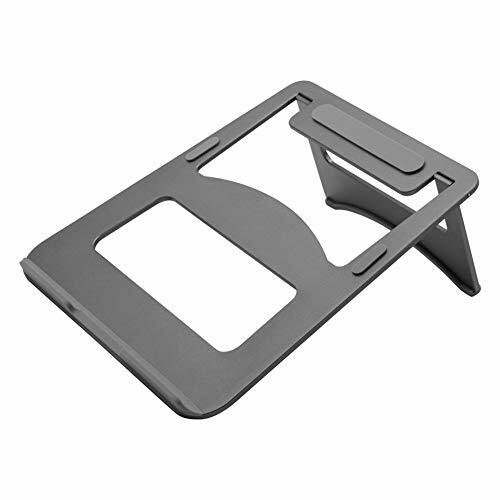 The bottom of the bracket is coated with silicone, which can not only prevent the skid but also protect your desktop from being scratched. 4. Size: As The Picture Shown. 5. Color: Grey, Silver, Rose Gold. 6. Compatibility: Laptop, Tablet, Notebook, PC, Smartphone (up to 17"). 【PREMIUM ALUMINUM CONSTRUCTION】The stand's sleek aluminum design includes a large open base allowing cables to loop easily through the back, preventing tangling. The open base also allows proper heat dispersion to prevent overheating. 【LIGHTWEIGHT, SOLID & COOLING AIR FLOW】Easily slip this compact laptop stand in your bag and take from home, to office, to store, and back! The aluminum material of this stand also naturally dissipates heat to air faster than plastic or wooden laptop docks without the use of battery power or electricity. 【4MM THICKNESS WITH SOFT SILICONE PAD】4mm extra-thick aluminum alloy features superior sturdy and fixed bearing. Silicone pads to keep it in place and prevent it from sliding down as well as scratches, durable and stable. 【WIDE COMPATIBILITY】Efanr laptop stand fits all laptops up to 17", such as 12 inch MacBooks, 13 inch Macbook Airs, 13 inch and 15 inch Macbook Pros, Microsoft Surface, Google Pixelbook, Dell XPS, HP, ASUS, Lenovo and more notebooks. 【WARRANTY & SERVICE】We strive for 100% customer satisfaction, it's very important to us. We are committed to resolve all issues in a friendly and satisfactory manner. If you are not absolutely 100% satisfied with our products, please contact us!